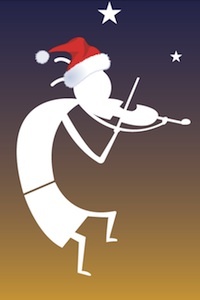 On behalf of myself and Laurie, I'd like to wish all our Violinist.com readers a very happy holiday season. I also hope that you will join me in taking a few moments to thank some of the others who help make this online violin community possible. They're the businesses and institutions whose financial support allow Laurie and me to publish Violinist.com, and for Laurie to bring you all these great interviews, tips and blog posts. As you do your holiday gift shopping online over the next few weeks (or as you compile your wish lists), I hope that you will consider these violin shops, schools and retailers first - to thank them for the support they've given this community. Taylor's Fine Violins, Redlands, So. Calif.
You always can find the complete list of current Violinist.com sponsors on the right side of any Violinist.com page. (They're over there now, under the "Holiday Shopping" header this month.) If you'd like to find out a little more about many of our long-time sponsors, please visit our Business Directory page, too. You'll find expanded listings, links, phone numbers and addresses for many top violin shops and gift retailers on that page. Laurie and I are always thankful for your time and attention in reading Violinist.com, and we hope that you will join us in thanking those businesses who help us pay the bills that keep this community open and welcoming to violinists around the world, 24 hours a day and 365 days a year. Thank you, again, and happy holidays, everyone!